57 year old Gavin Smith, a 20th Century Fox studio executive has been missing since Tuesday, May 1, 2012. Smith was last seen between 9 p.m. and 10 p.m. Tuesday leaving a friend’s house in Oak Park, CA. Gavin Smith’s wife reported him missing on Wednesday. He was supposed to pick up his son Wednesday morning and take him to school. He never showed. Gavin Smith is the father of three boys, including sophomore forward Evan Smith, who attends Southern Cal University. Presently, the LA County Sherriff’s Department says they do not suspect foul play. A search is under way for a 20th Century Fox studio executive who went missing several days ago, and sheriff’s deputies are asking for the public’s help to find him. Gavin Smith, 57, was last seen between 9 p.m. and 10 p.m. Tuesday leaving a friend’s house in Oak Park, along the southeastern border of Ventura and Los Angeles counties near Agoura Hills. Smith was driving his black 2000 Mercedes-Benz 420E with storage racks on the roof, tinted windows and California license plate number 6EKT044. He has not been heard from since, and family members are concerned. He is described as 6 feet 6 inches tall, weighing 210 pounds with green eyes, gray hair with blond streaks and a goatee. He has a 5-inch scar on his calf and a 4-inch scar on his inner right wrist. Authorities said he was last seen wearing purple pants and black and gray shoes. 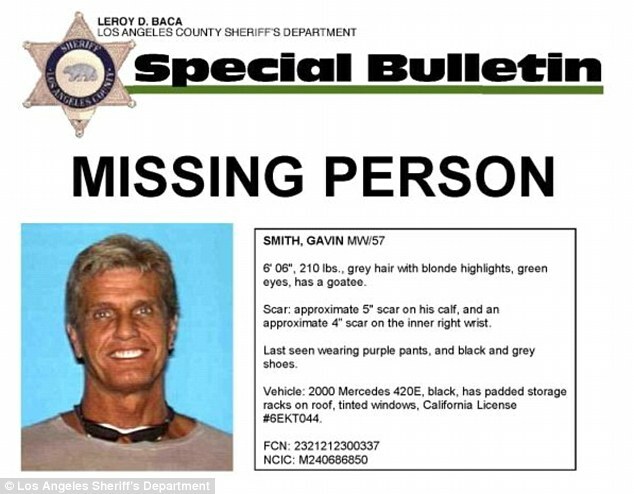 If you have any information about Gavin Smith’s whereabouts, please contact detectives at the Los Angeles County Sheriff’s Department’s Homicide Bureau at (323) 890-5500. Fox Exec Gavin Smith Missing Since May 1, 2012 … Now Considered Homicide Investigation? Was Missing 20th Century Fox Executive Gavin Smith Reported Spotted this Month at a Morro Bay, CA Restaurant?